This is a great year for anniversaries, both historical & literary. I plan to read something about all of these anniversaries this year. 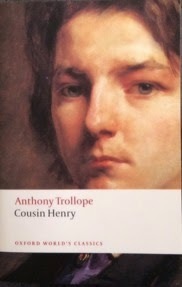 I've already mentioned the 200th anniversary of Anthony Trollope's birth & I've already read two Trollopes this year, Cousin Henry & John Caldigate. The Battle of Waterloo was 200 years ago. 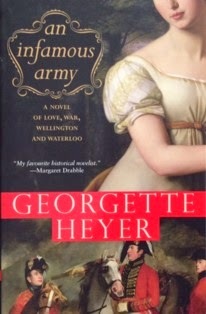 I'm not a big fan of military history so I'm going to read Georgette Heyer instead. However, in my defence, An Infamous Army was recommended reading at several British military colleges because of the accuracy of Heyer's research. I may as well get some romance & sparkling dialogue with my military history. I'm listening to the audio book read by Clare Higgins &, so far, it's living up to the romance & sparkling dialogue of the best Heyer. I don't know about Lady Barbara but I'm in love with Charles Audley already (half way through). 2015 is also the 70th anniversary of VE Day. Victory in Europe was an occasion for rejoicing & sadness as the toll the war took on everyone, in the services or on the Home Front, was enormous. 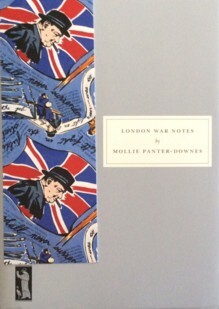 I have plenty of books on WWII on the tbr shelves to choose from, but I think I'll be reading one of the new Persephones, London War-Notes by Mollie Panter-Downes. 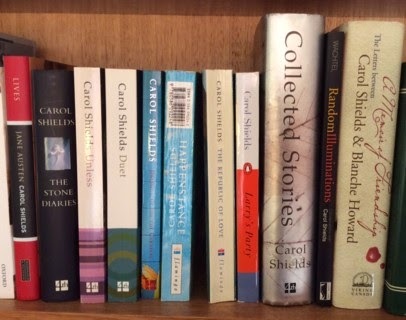 It's the 80th anniversary of the birth of Carol Shields. I had great plans to reread all her books this year but, it's June & I haven't started so I've decided to regroup. Where has the year gone? I don't know why I thought I'd start any kind of reading challenge at the beginning of the year, in summer, my least favourite season of the year. Winter is a much better time for me to settle down to a reading plan. A warm house, lots of tea & a cat or two on my lap - perfect. 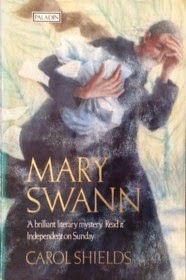 I've started rereading Mary Swann & next, I plan to read the Letters I bought last year. It's also 80 years since the death of Winifred Holtby. After recently rereading Vera Brittain's Testament of Youth, I want to reread her biography of Winifred, Testament of Friendship, as well as at least one more of Winifred's novels from the tbr shelves. 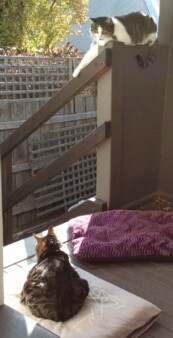 A brief moment of togetherness (this is as close as they ever get) on a cold but sunny afternoon. After a few grey days, Lucky & Phoebe enjoy the sunshine on the back porch while it lasts. This poem is from Millay's third collection of poetry, Second April. It's called Journey & captures the weariness of the traveller while also recognizing that the speaker wouldn't be happy if she wasn't always moving on or moving forward in her life. I've decided to use the bigger photos so that you can read the spines. It just means that you need to click on the photos to see all the books on each shelf. 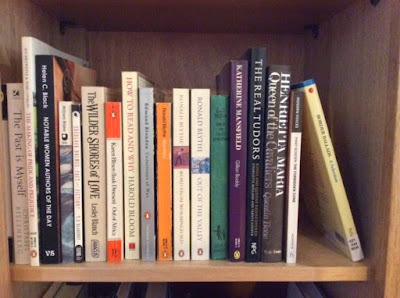 This shelf begins with Dostoevsky, a writer I'm still struggling with. I admire him rather than love him. I'm about to begin reading The Gambler with my 19th century bookgroup so we'll see if I get on with him any better this time around. Maybe I only keep his books on the shelf for their snob value?! I have no such problems with the other writers on this shelf. O Douglas is a relatively recent discovery, thanks to Greyladies. I've read the Sherlock Holmes stories many times & I can always pick them up with pleasure. The Penguin boxed set was a bargain & the volumes are just the right size to fit in my handbag. The Folio Society boxed set can be read at home & there's the giant annotated three volume set on the bottom of this bay of shelves because it didn't fit here. Margaret Drabble is another favourite as is David Duff. Like Theo Aronson, a biographer of royalty. Also, the beginning of my Daphne Du Mauriers. The rest of the Du Mauriers, Gerald Durrell's My Family and Other Animals, a new favourite after I listened to it for the first time last year. Anne Edwards is another favourite biographer. 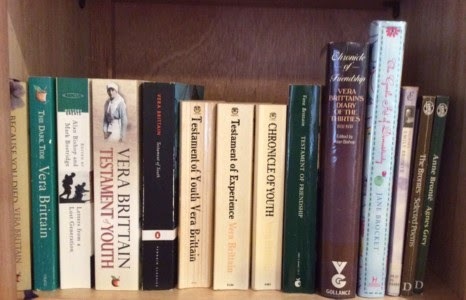 The books on the shelf are about Sonya Tolstoy, Queen Mary & Vivien Leigh (sorry about the glare on the spines). Then, the Eliots, George & T S.
Carolly Erickson is another royal biographer whose books I've read over the years. Her specialty was the Tudors & they're the books I enjoyed most. I remember being very unimpressed with her biography of Tsarina Alexandra some years ago. Also Susan Ferrier's novel Marriage. She was a Scottish contemporary of Jane Austen & that's one of the Viragos I picked up in a bookshop in the city over 30 years ago when they were marked down on special. I also bought Storm Jameson's autobiography & Susanna Moodie's Roughing it in the Bush, about her life in 19th century Canada. As always, I only wish I'd bought more marked-down Viragos that day. What's that saying? You only regret the books you didn't buy, not the ones you did (or something like that)? Penelope Fitzgerald is there too. I enjoy her fiction but love her non-fiction, the essays in A House of Air & her Letters, even though I was irritated by the way the editor arranged them & by the eccentric footnotes.I have Hermione Lee's biography of Fitzgerald on the tbr shelves & I must read it soon. Two more favourite biographers on this shelf. Margaret Forster & Antonia Fraser. I've realised that I must buy more non-fiction than fiction as I've also read many novels by both these authors yet there are very few on the shelf. I remember buying the blue copy of Fraser's Mary, Queen of Scots back in the 70s. I was so excited to see it in a bookshop that I couldn't stop looking at it all the way home in the car (my Dad was driving) & I dropped everything to start reading it when we got home. 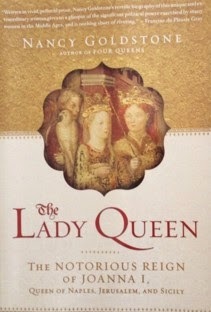 I've read it several times since along with many other books about the Queen of Scots. Antonia Fraser is just as obsessed with Mary as I was. She wore a Queen of Scots headdress at her wedding to Hugh Fraser. There's a photo in her recent memoir, My History, which I've not yet read. Maybe I'll listen to the audio book, read by Penelope Wilton, instead? More Antonia Frasers plus her biographer daughters, Flora & Rebecca. Lucy Frost's No Place for a Nervous Lady is a fascinating collection of letters & memoirs by women who lived in the Australian bush in the 19th century. Whether they'd just arrived from Europe or had grown up in the cities, the bush was a new & sometimes frightening experience for all of them. Galsworthy's Forsyte Saga - I still have Volume 3 tbr. 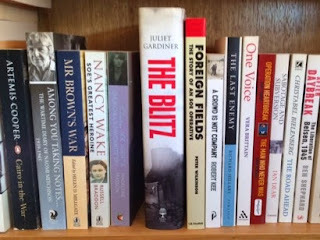 I remember reading Juliet Gardiner's Wartime just after I moved into this house, while the electrician was sorting out the lighting. I have two more of her books - The Thirties & The Blitz - tbr. Helen Garner, another author I've been reading since Monkey Grip in the 70s. In recent years, she's been writing non-fiction & Joe Cinque's Consolation is the best thing she's written, in my opinion. I gave my copy to my sister, which is why it's not there. My Elizabeth Gaskells are on this shelf & Winifred Gerin, biographer of Mrs Gaskell & the Brontës. Gibbon's Decline and Fall is there under false pretences, really. I confess, I haven't read it but I got so sick of seeing it on the tbr shelves so I put it away here. I couldn't bring myself to weed it as I really do want to get to it one day. I'm considering trying it on audio, there are several versions on Audible, & I've put the version narrated by David Timson into my Wishlist. 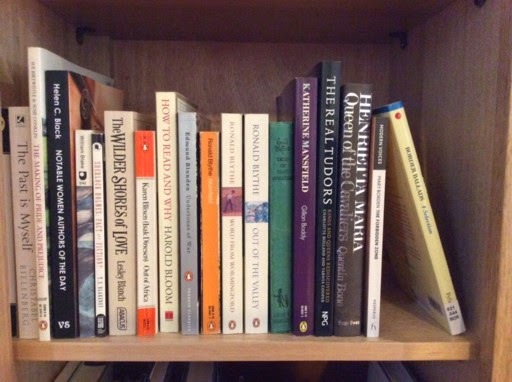 Stella Gibbons finishes off this shelf along with the annotated Sherlock I mentioned above. This is the story of two brothers, their foolish mother, who loves her worthless son & ignores his worthy brother, & about the intrigues that result when an inheritance is at stake. Agathe Rouget was born in the provincial town Issoudun. Her father favoured her older brother, Jean-Jacques, unfairly believing that Agathe wasn't really his daughter. Neglected & despised, Agathe soon leaves Issoudun, marrying a civil servant, Bridau, & moving to Paris. Two sons were born, Philippe & Joseph; Monsieur Bridau worked himself to death in the service of Napoleon, whom he worshipped, & his widow was let with very little money to live on. Agathe's widowed aunt, Madame Descoings, combines her household with that of her niece & the two women live frugally, their only aim in life to help Agathe's sons. Although Madame Descoings spoils both the boys, Agathe's favourite son is Philippe. Unfortunately he's a lazy, scheming, dishonest boy who grows up to believe that the world owes him a living, mostly paid for by the sacrifices of his mother. He joins the army, spends whatever allowance his mother gives him, stealing the money if it's not given to him, gambles, drinks, takes mistresses & generally lives the life of a spoiled brat. Cheated of advancement in the army by the downfall of Napoleon, Philippe refuses to serve the restored Bourbon monarchy & becomes involved in a fraudulent scheme to settle in America, losing all his money. All this time, he has ignored his mother, unless he needed money, while she has scrimped & saved, working in menial jobs & going without herself so that Philippe can have what he needs. Joseph is an artist. He decides early in life where his talents lie & he works hard at his art, not too proud to take on hack work such as copying old masters as he learns & tries to make a living. He loves his mother & is always kind & considerate but Agathe is dismissive of Joseph & his kindness. She sees the life of an artist as vaguely disreputable & expects him to go without if Philippe needs money. Philippe steals from his brother as well although Joseph can't afford to lose a sou. Agathe has never returned to Issoudun & had no contact with her family but, some years after her father's death, she hears from her godmother, Madame Hochon, that Jean-Jacques has fallen under the influence of a scheming woman, Flore Brazier & her lover, Max Gilet. Madame Hochon warns Agathe that if she wants her sons to inherit anything from her family, she needs to return to Issoudun & fight for her share. After Agathe left Issoudun, her father, Dr Rouget came across a beautiful child, Flore Brazier, & took her into his home. His motives were far from pure & he groomed Flore, intending her to become his mistress. Fortunately he was too old to take advantage of her & Flore was left at his death with beauty & enough education to know where her own best interests lay. She had no trouble gaining a dominance over Jean-Jacques, who was a simple-minded, foolish man. Flore was soon installed as his housekeeper & did as she pleased. Jean-Jacques was happy enough to have Flore as his housekeeper & mistress but didn't think it was proper to marry her. She fell in love with Max Gilet, an ex-army officer who was said to be an illegitimate son of Dr Rouget. He was the leader of a gang of young men who called themselves the Knights of Idleness & spent their time playing cruel practical jokes on the townspeople. Flore & Max planned to get as much money out of Jean-Jacques as they can & then run away to get married. Madame Hochon's letter to Agathe threatens to put a stop to their plans. Agathe & Joseph go to Issoudun as Philippe is in prison, charged as a member of a group of Bonapartists conspiring to overthrow the King. They soon see the danger to any possible inheritance but are powerless to influence Jean-Jacques or stop Flore & Max. The only weapons they have are goodness, honesty & family feeling. Only when they have retreated to Paris & Philippe arrives to take over the assault is there any chance that the Bridaus will prevail. Only a wicked man like Philippe can possibly counter the plans of two such conspirators. Evil, in the form of Philippe & Max, seems to have everything its own way. The superficial attractions of good looks & a glib tongue help Philippe in his criminal career but Agathe is to blame as well for her for her blind partiality. Even as Philippe steals from her, Joseph & even from Madame Descoings, she finds excuses for his behaviour. The characters are so engaging. Madame Descoings, with her addiction to the lottery & her belief that her numbers, which haven't come up in the last twenty years, will come up one day. Monsieur Hochon, a miser who unwillingly becomes involved with the Bridaus' quest for justice. Fario, the Spanish merchant who is the victim of one of Max's practical jokes & who takes his revenge. Flore, who rises from very humble beginnings to become the most powerful & feared woman in the town. She uses her looks & intelligence to create the kind of life she could never otherwise have dreamed of, exploiting the stupidity of Jean-Jacques to do so. Only when she falls in love does she begin to lose control. The Black Sheep is a terrific read. The amused, cynical tone of the omniscient narrator sets the scene for a family saga, a thriller & a wonderful portrait of provincial life in early 19th century France. The last third of the book reads like a thriller as the plotting & scheming comes to a climax & it's hard to know who to barrack for when everyone is selfish, stupid or greedy & it seems that, again, the good will end badly & evil triumph. It's also a testament to the skill of the writing that I was barracking for Philippe in his battle with Max & Flore, even though I knew what a disreputable, worthless character he was. I raced through the last chapters to find out how it would all end. 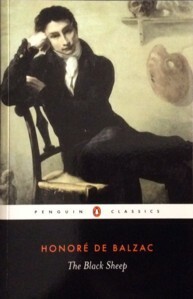 The Black Sheep is part of Balzac's monumental series of novels, The Comédie Humaine. I've read several of the novels, completely out of order, & I don't think it matters. Characters recur in several of the novels but the books I've read so far stand alone. 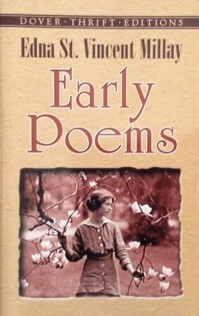 I've moved on to Millay's second book of poetry, A Few Figs from Thistles, & it seems appropriate that I've discovered Millay as I seem to be reading about several American writers at the moment. I've just finished reading Willa Cather's letters & her letters to Dorothy Canfield Fisher (author of Persephone's The Home Maker) were especially interesting. Cather & Canfield Fisher met when Cather was just establishing herself as an author & the six year age gap seemed enormous. Canfield (as she then was) looked up to Cather & admired her. However, they had a falling out in about 1905, & it was many years before the estrangement was resolved. The cause of the quarrel had puzzled scholars for years until the discovery of some of Cather's letters to Canfield in a barn (of all places) where they had been forgotten when Canfield Fisher's papers were donated to the University of Vermont in the 1950s. You can read the whole story here in this fascinating article by Mark J Madigan. Willa Cather also knew Sarah Orne Jewett, so now I want to read more of her work. I read The Country of the Pointed Firs many years ago but now want to read her other stories. I also have several books on the tbr shelves that I want to get to - Elaine Showalter's survey of American women's literature, A Jury of Her Peers, Work by Louisa May Alcott, A New England Nun and other stories by Mary Eleanor Wilkins Freeman, Ruth Hall by Fanny Fern & The Morgesons by Elizabeth Stoddard (my 19th century book group will be reading this soon) as well as several unread Cathers & two books by Canfield Fisher, The Brimming Cup and The Deepening Stream. Any recommendations about where I should begin? Anyway, back to Millay. This is Recuerdo (which means I remember in Spanish as I've just discovered). After the more melancholy poems of recent weeks, this one is happy & bouncy in mood & rhythm. Cather to Donne this week. I've been rediscovering Willa Cather over the last year. I've just finished reading her Selected Letters & I have several more novels on the tbr shelves to read. I read O Pioneers! & My Àntonia over 30 years ago & only came back to her recently. I've been reading about more American women writers in Elaine Showalter's A Jury of Her Peers so I'm glad I have books on the tbr shelves by Sarah Orne Jewett, Louisa May Alcott & Dorothy Canfield Fisher. There's also The Worst Journey in the World by Apsley Cherry-Garrard, one of the most devastating books I've ever read as well as some Agatha Christies (Joan Hickson covers) that I saved from my Dad's bookshelves when we emptied his house after he died. More Christies, Christmas books (stories & carols) & the beginning of the Wilkie Collins collection, one of my favourite writers. The rest of the Wilkies, a few Edmund Crispins, one of my favourite mystery writers, & Eleanor Dark's Timeless Land trilogy. I read these many years ago when the TV series was made. It's a story of early colonial Australia & I remember how much I enjoyed it. 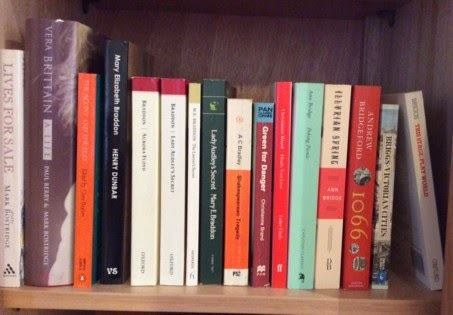 Also Eve Curie's biography of her mother (the green book 11 from the right), another old favourite. A shelf that displays my bad habit of collecting copies of favourite books. Three copies of The Diary of a Provincial Lady (I also have the Persephone edition but that's shelved with the Persephones) & several duplicate Dickens. Also To Serve Them All My Days by R F Delderfield (much faded TV tie-in edition with John Duttine on the spine, loved that series & read the book at least three times) & the Henrietta books by Joyce Dennys. 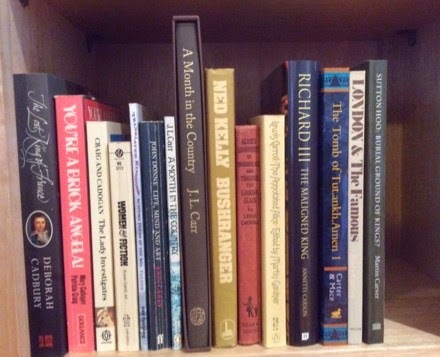 More Dickens, Emily Dickinson & John Donne, a very high-powered literary shelf! I do hope you're all noticing the spaces I'm leaving for the books from the tbr shelves as I read them. It would probably be useful if I stopped buying tbr books for a while, at least until I've filled some of these gaps, but I haven't quite managed that yet. Next week, Dostoevsky to Gibbons. Edited to add : I've just realised that the photos are too long for the screen, so you'll need to click on the photos to see the whole thing. They looked fine when I wrote the post so I must try something different with the photos next week. It's difficult to strike the balance between the photos fitting on the screen & being large enough so that you can see the titles. Before Willa Cather died, she did what she could to prevent this book from ever existing. She made a will that clearly forbade all publication of her letters, in full or in part. And now we flagrantly defy Cather's will in the belief that her decision, made in the last, dark years of her life and honored for more than half a century, is outweighed by the value of making these letters available to readers all over the world. This is how Andrew Jewell & Janis Stout begin their Introduction to this volume of the letters of Willa Cather. My first reaction was to think, Well, they would say that, wouldn't they? Then again, if I was going to take the high moral ground, I would have closed the book immediately & returned it to the library the next day. Instead, I read every word & loved it. 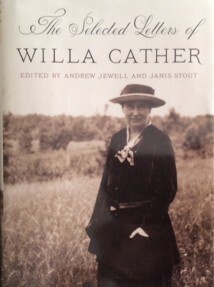 Jewell & Stout go on to write that Cather may have wanted to prevent the reputation of her work being overshadowed by her private life. She was always careful to protect the two most important emotional relationships of her life, with Isabelle McClung & Edith Lewis, from prying eyes. As it is, very little of Cather's correspondence with either woman survives. In this book of over 600pp, there are only a couple of short notes or postcards to each of them. She also left the ultimate decision about publication in the future to her Executors & Trustee. Jewell & Stout believe that "These lively, illuminating letters will do nothing to damage her reputation." which is certainly true. Willa Cather was born in Virginia in 1875 & moved to Red Cloud, Nebraska as a child. After attending university in Lincoln, Nebraska, she worked as editor of McClure's magazine in New York, travelled several times to Europe &, more productively for her fiction, to Arizona, New Mexico & Quebec. While working at McClure's, she began publishing her own work & working on the magazine, often filling the pages herself, was a wonderful apprenticeship. She remained close to her parents & her elder brothers, Roscoe & Douglass; girlhood friends such as the Miner sisters; fellow writers, especially Dorothy Canfield Fisher, & her publisher, Alfred Knopf. All these relationships are well-represented in the letters. 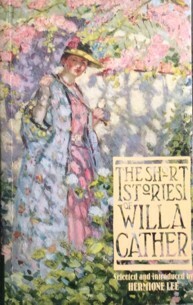 Cather's growing reputation led to correspondence with readers & critics which often leads to fascinating stories about the origins of her novels. The friendship with singer Olive Fremstad that was the inspiration for The Song of the Lark; her memories of her immigrant neighbours in Red Cloud that inspired stories like The Bohemian Girl & the novels O Pioneers! & My Àntonia. The trip to New Mexico & her reading about the French Catholic missionaries that became Death Comes for the Archbishop; the childhood memory of a day at her grandmother's house in Virginia that was the beginning of Sapphira and the Slave Girl. She was also interested & knowledgeable about every aspect of the production, presentation & promotion of her work from the font type & size, the bindings & illustrations to the copy written by the publicity department of her first publisher, Houghton Mifflin. Cather lived in New York for many years but always tried to leave the city during the heat of summer. She had several favourite places, from Jaffrey, New Hampshire to Grand Manan Island, New Brunswick, where she & Edith Lewis owned a cottage. She also spent considerable time in France & New Mexico. The editors have left Cather's wayward spelling as a young girl alone & it gives a picture of impetuous enthusiasm about books, music & the theatre as well as an intense interest in everything that was happening to friends & family. Although her spelling improves, her love of literature & music is with her all her life. Cather was a loyal & generous friend, never forgetting S S McClure, who had given her the opportunity of editing his magazine. She also went home to Nebraska frequently & always remembered friends & neighbours at Christmas & especially during the hard times of the Depression years. Her own success meant that she had the ability to help in practical ways as well as with kind thoughts & sympathy. Reading an author's letters always takes me back to the work & I've been rereading some of Cather's short stories. I bought this Virago edition of the stories, edited by Hermione Lee, in the late 1980s. I've read The Bohemian Girl, Two Friends, A Wagner Matinée & Coming, Aphrodite! & will probably go on to read the rest of the book, as well as the novels I haven't yet read. Edna St Vincent Millay wrote many sonnets & I especially like this early sonnet about the grief of missing a loved one. A few more Brontë books & the Brownings, Robert & Elizabeth Barrett. 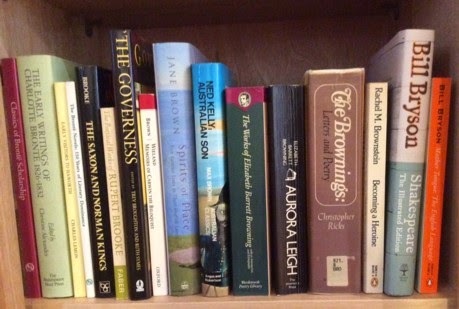 By the way, any books you see with library spine labels on them have been legally deaccessioned (weeded) from various libraries I've worked in & brought home to be properly appreciated. 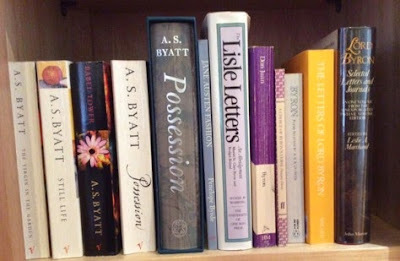 I try to remove all the labels (ie getting rid of the evidence) but the spine label on The Brownings : Letters and Poetry is under the covering of the book which has been rebound. We don't rebind books any more, we replace or withdraw, which is quite a contentious topic in library land which I'm going to leave very much alone. I remember reading the Women's Press edition of Aurora Leigh on the porch of my friend P's house at Daylesford over 30 years ago. I stayed there for a winter week on my own. The house was right on the lake & this was years before Daylesford became a New Age tourist destination. 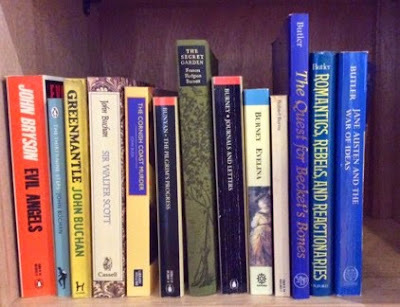 As well as Aurora Leigh, I read a book on Shakespeare's sonnets (which we'll be seeing later on the G shelf) & Byron's Don Juan, which is just below. John Buchan & Fanny Burney on this shelf as well as Marilyn Butler's terrific books about Jane Austen & her times. I've also read her biography of Maria Edgeworth. 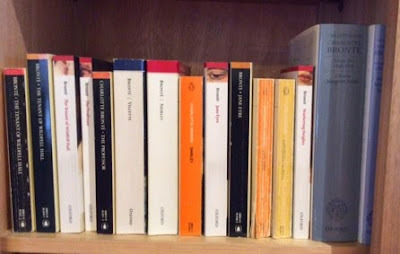 My Byron collection is here (including Don Juan) & A S Byatt. Possession is one of my favourite books, so, of course I have two copies. One of them is a Folio Society edition, so I feel it's completely justified. Another Folio Society edition of another favourite book, A Month in the Country by J L Carr. Also my childhood copy of Alice & the books by Mary Cadogan & Patricia Craig about girls' school stories and women & detective fiction. I often dip into these & they're great fun if you have any interest in early-mid 20th century fiction. Archaeology is another of my interests & there are two classics there - Martin Carver's book on Sutton Hoo & a facsimile of Howard Carter's book on the discovery of Tutankhamen's tomb. The Golden Age of crime fiction spanned the period between the World Wars. There are many stereotypes about the books written during this period, most of them inaccurate & quite lazy. The books were just puzzles, with cutout characters reminiscent of the board game Cluedo. Their authors didn't play fair with the reader, including untraceable poisons & mysterious Chinamen in an effort to bamboozle the reader. In reality, the best books of this period have been read & loved by millions of readers. Their plots, far from being cosy, featured serial killers, sadistic murders, plots based on real crimes of the period & the beginnings of the forensic thriller. The names of the greatest authors of the period - Agatha Christie, Dorothy L Sayers, Margery Allingham, Ngaio Marsh - are still well-known today. Their books are still read, we listen to audio books & radio productions & watch the many TV adaptations. Martin Edwards tells the story of the Golden Age through the history of The Detection Club & the authors who founded it & were its members. It's the story of a period of history & a group of writers that have always fascinated me. The Detection Club was founded in 1930 by a group of writers that included Christie, Sayers & Anthony Berkeley Cox, who wrote under the names Anthony Berkeley & Francis Iles. The Club was an exclusive one. Members had to be proposed by a current member & approved by the committee. The initiation ritual, complete with members dressed in ceremonial robes & the swearing of an oath to uphold fair play in the plotting of the detective novel taken while holding a skull known as Eric, was all part of the game. The Club met for dinner & conversation several times a year in London & the meetings provided an opportunity for gossip about publishers, agents, sales, the topics that probably feature in the conversation of any group of writers. For some of the members, the Club provided an escape from the disappointments & problems of their private lives. Writing is a solitary occupation & the opportunity to talk shop with colleagues must have been another attraction. 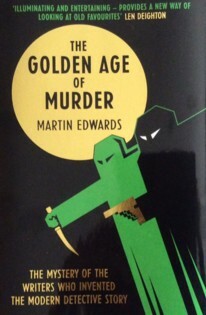 The Golden Age of Murder focuses principally on three writers - Agatha Christie, Dorothy L Sayers & Anthony Berkeley Cox. Much has been written about Christie & Sayers but I was especially interested to read more about Berkeley. He was an innovative novelist whose brilliant plotting was a feature of his work. Two of his books written under the pseudonym Francis Iles radically changed the conventions of detective fiction. In Malice Aforethought, the reader is in the confidence of the murderer from the beginning & the opening of Before the Fact tells us that Lina Aysgarth was married to a murderer before taking us back to the beginning of their relationship with this knowledge in our minds. Under the name Anthony Berkeley, he wrote a series of novels featuring Roger Sheringham, an amateur detective who usually gets everything wrong before finally coming up with the correct solution. Berkeley felt adrift after his war service & tried various jobs before becoming a writer. He was a contradictory personality, eccentric, obsessive, difficult. His private life was unconventional & this is something he had in common with other members of the Detection Club. One of the most interesting aspects of the story is the private lives of the members. A theory I've heard several times about the Golden Age writers is that their interest & facility in writing detective stories came from the need to hide secrets in their private lives. Just last week, I listened to the latest episode of BBC Radio's Great Lives where Val McDermid discussed P D James, who gave a lecture on this theory. Christie famously disappeared for twelve days in 1926, distressed over the end of her first marriage. Even after her happy second marriage to archaeologist Max Mallowan, Christie, an intensely shy woman, shunned publicity. Sayers had an illegitimate son, whose existence she kept secret from all her closest friends. Her difficult marriage, to an alcoholic who had suffered from his war experiences, was another reason for her love of the Detection Club's dinners & the gusto with which she entered into the spirit of all the rituals & rules. Edwards also mentions many other writers, some of them famous in their day but unknown now. Interestingly, as consultant to the very successful British Library Crime Classics series, Edwards has been instrumental in bringing some of these authors back into print. Christopher St John Sprigg, J Jefferson Farjeon & Freeman Wills Croft are just three authors mentioned in this book who have been brought back into print through this series. Another cliche of the Golden Age is that it was dominated by women writers, the Queens of Crime. Martin Edwards features many male authors of the period, some of them undeservedly obscure now. His knowledge of the period is exhaustive & obviously the product of many years reading & research. Martin's blog, Do You Write Under Your Own Name? bears witness to this interest with regular posts on forgotten books & interesting snippets of information from his ongoing research into this fascinating period of literary history. It's impossible for me to encompass this book in a brief review. I haven't even mentioned the interest in true crime that led to the anthology, The Anatomy of Murder (recently reprinted), or the collaborative novels published by members of the Club (Ask a Policeman, The Floating Admiral) to replenish their funds & pay the rent on their Soho rooms. I enjoyed reading about the group dynamics of these projects, with Dorothy L Sayers bullying & cajoling members into writing their contributions & submitting their copy. The current members of the Detection Club (including Edwards who is the Archivist of the Club) are working on a group novel of their own called The Sinking Admiral in homage to the earlier book. There are also some fascinating photographs in the book, including one of my favourites of Dorothy L Sayers & Helen Simpson drinking beer & Gladys Mitchell in her other job as a PE teacher, instructing her pupils. The research that has gone into the book is phenomenal as can be seen by the rare illustrations & the detail in the footnotes. 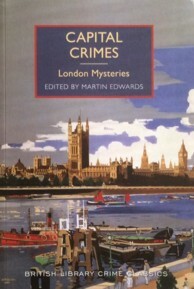 I mentioned the British Library Crime Classics above & I've been reading a recent anthology, Capital Crimes, edited by Edwards, which throws light on a discovery in the book that I found really thrilling. 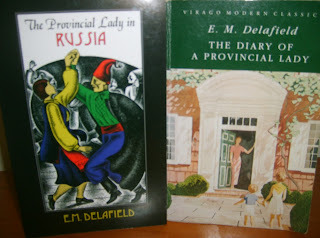 Martin Edwards has discovered a connection between Berkeley & one of my favourite authors, E M Delafield, that has been previously unsuspected. I won't go into detail but the clues are there in Delafield's work if you know where to look. Although best-known today for her delightful Diary of a Provincial Lady & its sequels, Delafield had an interest in true crime & wrote a novel, Messalina of the Suburbs, about the Edith Thompson case (which disturbed & fascinated several of the Detection Club members). The story by Delafield in Capital Crimes, They Don't Wear Labels, is a revelation & just one example of the influence her friendship with Berkeley had on her own work. The success of the British Library Crime Classics as well as the continuing popularity of adaptations of Golden Age novels attest to our love of this period of detective fiction. I'm just as fascinated by the authors as their books so The Golden Age of Murder has been a real treat for me. I think anyone who has read the novels of this period would find much to enjoy in Martin Edwards' book & the recent reprints by several publishers, including Dean Street Press, Langtail Press, Rue Morgue & Felony & Mayhem (featuring Berkeley's The Poisoned Chocolates Case this week) mean that if you've read everything Sayers, Christie & Allingham ever wrote, you have many more authors to discover. Another sonnet from Millay's first collection, Renascence and other poems. I love the way we're just dropped into a situation, one of those imaginings that we all have (if we're the worrying sort) about a loved one. It reminds me of the scene in Waterloo Bridge, where Myra (Vivien Leigh) sees the newspaper report of Roy's death while she's waiting to meet his mother in a teashop & has to try to look as though nothing is wrong. I must watch that movie again, it's one of my favourites. Week 3 of the great bookshelf project. Enid Blyton's Tales of Great Adventure (the green book sixth from the right) was one of my favourite books when I was a child. It's a retelling of the stories of King Arthur & Robin Hood & it's the way I always think of them, no matter how many books I read about the origins & maybe real people behind the myths. Ronald Blythe is one of the first authors I reviewed on the blog & I still have several of his books on the tbr shelves. One of my favourite Sensation authors is featured here, Mary Elizabeth Braddon as well as Ann Bridge. 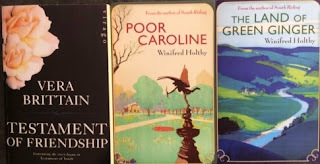 I loved her Julia Probyn series although, as I read them all as ebooks, they have no presence on the shelves. Green for Danger by Christianna Brand is one of the most famous (& best) Golden Age mystery novels. Set in a hospital during WWII, it's an atmospheric book with a great twist in the plot. It was also made into a movie with Alistair Sim, Trevor Howard & Leo Genn. Vera Brittain & the beginning of the Brontës. The end of the Brontës. I wish I had the first volume of The Letters of Charlotte Brontë. I bought Vols 2 & 3 but borrowed Vol 1 from the library. It's very expensive & OUP have never reprinted it in paperback. I don't need it, of course, but I'd like to have it. I know very little about Italian history & even less about Italy in the medieval period so, when I picked up this biography of Joanna I of Naples, I was interested to learn more. What a fascinating journey it turned out to be. Joanna was born in 1326, and, after being orphaned very young, grew up at the Court of her grandfather, Robert the Wise, King of Naples & his second wife, the very religious Sancia of Majorca. Robert was a descendant of the Angevin rulers & held his kingdom of Naples as a fiefdom of the Papacy, paying a yearly tribute for the privilege. Robert's reign was a golden age of prosperity but there were problems, mostly of Robert's own making. Robert's second marriage, to Sancia, was childless, mostly because she was extremely religious & would not allow him his conjugal rights. As Robert had no living sons, this was a problem for the succession. He made his granddaughter, Joanna, his heir but, in so doing, dispossessed his nephew, Carobert, the son of Robert's elder brother. Carobert was sent off to Hungary to become King in due course. However, the long-term consequences of this decision would have a catastrophic effect on the security of the kingdom during Joanna's reign. Robert attempted to address Carobert's grievances by offering to marry Joanna to his son, Andrew. The boy was a year younger than Joanna & arrived in Naples at the age of six. Joanna & Andrew were married soon after & Robert made all his nobles swear allegiance to the couple as the future king & queen. It was hoped that this would satisfy the Hungarian claims to the throne of Naples. Joanna came to the throne at the age of 17. She had had a thorough education in courtly ways from her grandfather & in religious matters from her step-grandmother, Sancia. Joanna's marriage, however, was not a happy one, despite the birth of a son, Charles Martel. Although Joanna & Andrew had been brought up together, they were not close. There was prejudice against Andrew by the leading nobles, both because he was Hungarian & because his marriage to Joanna prevented one of their sons from becoming king. Andrew was also compared unfavourable with Joanna's cousins, the Durazzo & Taranto families, who also aspired to the crown. Joanna faced many challenges during her years as queen but none was more confronting than the murder of Andrew by a group of jealous nobles in 1345, just two years after she came to the throne. Joanna's Hungarian in-laws were outraged & Andrew's brother, Louis, now King of Hungary & his formidable mother, Elizabeth, demanded justice. They also used the murder as a lever to push Louis' own claims to the throne of Naples. Joanna was accused of involvement in the murder & was forced to flee Naples & seek the Pope's protection at Avignon. She was then forced to go on trial for her husband's murder at the Papal Court before Pope Clement VI. Joanna convinced the Pope of her innocence although she wasn't able to save the lives of many of her closest friends & supporters who were imprisoned, horribly tortured & executed by the Hungarians, who ruled Naples after her flight. Joanna had to leave her young son behind & he was taken back to Hungary by his relations, where he died soon after. Joanna knew that she had to remarry quickly. She needed a champion, a proven warrior who would help her regain her kingdom. She chose Louis of Taranto, who had his own claim to the throne of Naples. Eventually, after bribing the Pope with the transfer of the city of Avignon to his authority, the Pope recognized Joanna's marriage to Louis & advanced the money they would need to amass an army to drive the Hungarians out of Naples. They were successful & by 1349, Joanna had reclaimed her kingdom. Unfortunately, Joanna's personal life was never easy. She & Louis had two daughters, who both died young. Their marriage collapsed soon after the return to Naples & Louis was accused of treating Joanna very badly, attacking her physically & flaunting his affairs. Joanna married twice more. After Louis' death in 1362, she married James IV, King of Majorca. This was another disaster. James had been imprisoned as a young man by the King of Aragon for over 15 years & emerged from this ordeal with this health shattered, both physically & mentally. After James's death in 1375, Joanna finally found the husband she had needed all along. At the age of 49, she married 55 year old Otto of Brunswick. Otto was a member of a minor German noble family, a very inferior match in worldly terms. However, he was a fine soldier, had no claim to the Neapolitan throne & no expectations of usurping Joanna's prerogatives. Unlike her first three husbands, Otto had no prospect of being crowned King Consort & doesn't seem to have expected it. Joanna's relations with the Papacy were also fascinating. She was bound very closely to the Pope of the day because of Naples' status as a vassal of the Papacy. Joanna's relations with successive Popes were vital, both because the Pope had such power over the kingdom & its people in both a spiritual & a practical sense. Joanna was excommunicated several times & Naples placed under an Interdict. However, Joanna mostly managed to steer clear of major disruptions, quite a feat during this time when the Pope had been forced to flee Rome for Avignon &, near the end of Joanna's reign, she became involved in the Great Schism, when there were two Popes vying for legitimacy. It can be very difficult to get a sense of the life of an individual woman in the Middle Ages, especially when there are no private letters or diaries to consult. Joanna speaks to us in the form of official letters but also in her actions. She was remarkable because she was the only woman in this period to rule in her own right. Although she needed to marry to support her rule, she never allowed her consorts to rule alongside her. She was incredibly unlucky as her reign coincided with outbreaks of plague & the growth of the Free Companies, bands of mercenaries let loose across Europe after the conclusion of wars. 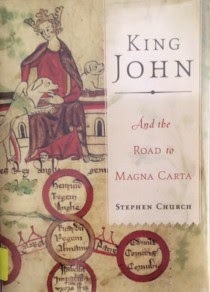 Economic conditions were also bad, with poor harvests & the collapse of the great banking families who had financially supported Joanna's grandfather, Robert the Wise. Joanna faced constant plotting by her Hungarian relations as well as her Neapolitan family, all of them ruthlessly ambitious. She also had no heir, which only increased the plotting as the factions circled her throne. Of all the illustrious women of this world, Joanna, radiant rose among thorns, infolded us, the whole Roman Church and her subjects in an amazingly sweet scent ... She passed on from the misery of this world to the beatitude of God's kingdom where she lives and reigns and where, despising and mocking her adversaries, she recovers the sceptre that has been taken from her and receives her crown among the same martyrs. Clement owed his position to Joanna as she had supported him during the Schism so his accolades are not entirely objective. However, I certainly agree with Nancy Goldstone that Joanna was a remarkable ruler who achieved an enormous amount for a woman in the 14th century. Goldstone tells a complicated story with great clarity. I was able to keep track of the many different factions & families even though I listened to the book on audio. I also have her book, Four Queens, about the Provencal sisters who all married European kings, on the tbr shelves & I'm looking forward to reading it, as well as reading some more Italian history.